Under intense international pressure, the Maldive ruling mullahs are attempting to appear as though they are back-tracking on their recent ban on the Universal Declaration of Human Rights (UDHR). On 11th July 2005, the office of the head mullah and President of the Republic issued a media release stating that the “Supreme Council on Islamic Affairs was not mandated with interpreting the Constitution” The Supreme Council had earlier issued a ban on members of the public being in possession of the text of the UDHR. "Democracy guarantees the right to choose your religion - and this is against the rule of Allah!" - Abu Musab el-ZarqawiThe mullahs are clearly pretending that they are operating within an environment in which state authorities are devolved. There is no state authority in the Maldives, including the Supreme Council for Islamic Affairs that has the authority to act without the written permission of the Office of the President of the Republic. It is well known that public officials in the Maldives who violate or overlook laws, regulations and procedures in the discharge of their duties, without the consent of the President of the Republic, are censured and required to make amends if not dismissed and sent to one of the torture gulags. 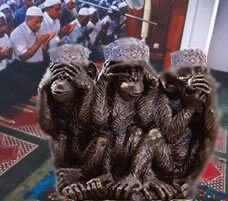 There are no reports of any member of the Supreme Council for Islamic Affairs being disciplined. The Supreme Council has so far not rescinded its July 5th public announcement regarding the ban on the possession of the text of the UDHR. The true test of whether or not the Maldive mullahs have been sincere in their statement that “there is no legal basis to the ban [on the UDHR] and therefore no legal effect” is a revocation of the 5th July public announcement by the Supreme Council for Islamic Affairs, and the revocation published in Maldive newspapers and read over public radio and television. The Maldive Human Rights Commission must also be seen to be distributing the Divehi language translation of the UDHR, as it had done until July 5th. The international community must not let the Maldive ruling mullahs take them for a ride.